The London Summit was opened by EBRD President Suma Chakrabarti, Boyko Borisov, Prime Minister of Bulgaria, which heads the EU Council and UK Secretary of State for Digital, Culture, Media and Sport Matt Hancock. Prime Minister of the Republic of Serbia Ana Brnabic participated in the panel of the Prime Ministers of the Western Balkans, within the framework of the Western Balkan Investment Summit organised by the European Bank for Reconstruction and Development (EBRD) in London. Prime Minister Brnabic talked about the priorities of Serbia, the vision and importance of regional cooperation and regional projects, and presented the opportunities and advantages of investing in Serbia. She said that the signing of the Agreement on the Transport Community of South-East Europe, as well as the support of all parties for Belgrade to be the seat of the Secretariat of the Transport Community, have shown the importance of the projects that connect the region in the best way. In addition to infrastructure projects, Prime Minister Brnabic stressed the importance of the gas interconnection between Serbia and Bulgaria, which should contribute to the long-term energy security of the entire region, and the significance of this project can be seen from the fact that it will be co-financed with funds from IPA worth around €50 million. In her address to investors and businessmen, the Prime Minister said that the region needs a new model of economic growth, based on higher productivity and investment, increased exports and the strengthening of the role of the private sector. Strengthening political and economic cooperation will contribute to a better position of the region on the global investment map, and EU membership is a common goal of all in the region, the Prime Minister emphasised. The Prime Minister underlined that Serbia has the most foreign direct investments of all in the Western Balkans. According to her, structural reforms and improvement of the business and investment climate contributed to the high rate of foreign direct investment, which amounted to €2.6 billion last year, being 27 percent more than the previous year. After the panel of the Prime Ministers, PM Brnabic attended the presentation of the on-line Regional Investment Platform. 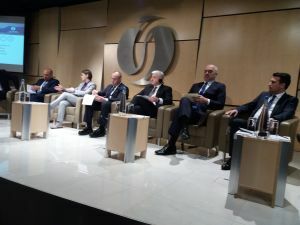 The aim of the platform is to promote the region of the Western Balkans as a unique investment destination and is designed to inform potential investors about investment opportunities and encourage transparent business.